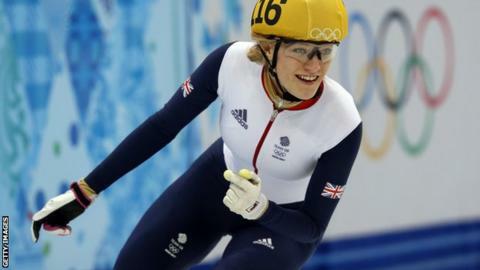 Elise Christie says she is aiming to develop into the "perfect speed skater" over the next couple of years. Britain's Christie, 24, is preparing to defend her 1000m title at the European Short Track Speed Skating Championships in Dordrecht this weekend. She will also compete in the 500m and says she is focusing on complementing her power and speed on ice. "I've been taking a step back from the physical side of training to concentrate more on tactics." She added: "Hopefully next year or the year after, the two will mould together and I can become the perfect speed skater." The new approach has already borne fruit with two bronze medals at the most recent World Cup event in Seoul in December. Meanwhile Christie's team-mate, Charlotte Gilmartin, reached her first World Cup A final in Montreal this season, skated a personal best and posted several top-16 finishes. Gilmartin said her new confidence "helps me to relax in races now, knowing I've skated the best I've ever skated and hopefully I can keep building". In the men's events, for Team GB, will be Jack Whelbourne and Paul Stanley, with Jon Eley, Billy Simms and Richard Shoebridge joining them in the 3000m relay team.